I don't even know how to begin to describe my feelings for Hopeless! I'm not sure there are enough words to describe how passionate I am about this book. I think every person who loves to read needs to read this masterpiece. Colleen Hoover with Hopeless has absolutely changed the way I read books. It is the standard for which I grade every other book with and nothing has yet to compare for me. Ever. Hopeless starts by introducing Sky, a teenage girl who has been sheltered her entire life. I'm talking seriously sheltered, no cell phone, no computer or Internet access and absolutely no TV, but surprisingly she harbors no resentment towards her mother for this lifestyle. Her only friend is leaving to study abroad in Europe just days before she is slated to begin her first day ever at a public school, she grew up being homeschooled. And let's not forget about Holder, upon being introduced, you learn he is the ultimate good looking, seriously bad boy with a shady past and a great sense of humor. He is passionate yet you find yourself just as frustrated with him as Sky, not understanding his ever present mood swings. I was constantly racking my brain trying to figure out what made him tick, what set him off. Does he care for Sky or has whatever he keeps hidden from his past ruined him? Sky and Holder have a strong connection and intense feelings neither one can deny nor do they seem capable of facing them. Colleen's writing links you emotionally with Sky, she allows you to feel and experience everything Sky does. There were times I found myself laughing out loud, not just a chuckle but genuine laughter. Then in a matter of a couple of pages real tears were running down my face! This story is an emotional roller coaster and you don't even see the falls, twists and turns that Colleen throws at you! I can tell you I was shocked as all the details of this story poured out and the pieces of the puzzle were put together. This is a tragically beautiful story about first love, finding yourself and confronting the demons of your past. Yes, Colleen you are seriously brilliant! God gifted you with an amazing imagination and then paired it with the gift of story telling. Sky and Holder's story invoked so many consuming thoughts and feelings that I'm still thinking about it now, six months since I first read the book! This is not just a book but a journey. 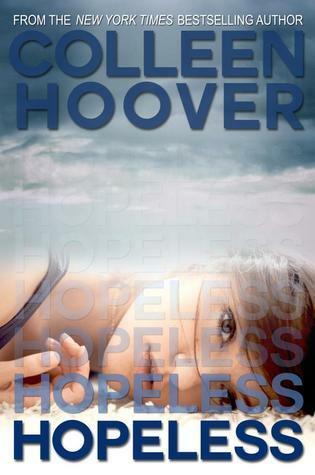 Fortunately for us Losing Hope a companion book to Hopeless told from Holder's POV comes out in July and I have no doubt it will be just as amazing. Check back next month for our review of Losing Hope.